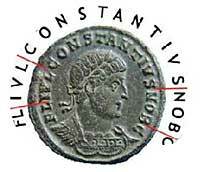 Please note that by no means all cheaper common Roman coins from uncleaned ancient coin purchases ( which are nearly all late (4th Cent) Roman bronzes) will be identifiable* especially as a large part of the Inscription may be illegible or missing, and so you may only be able to identify the "possible/probable" Emperor or the Reverse type of the coin..
AVGG used to denote that there was more than one emperor ruling at the same time either jointly or simultaneously in another part of the empire. The number of *G*s* denotes how many emperors this particular emperor recognized. DN Dominus Noster *Our Lord*, in use from the early 4th century through the Byzantine period. 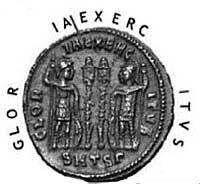 IMP Imperator This title meant the equivalent of *Commander in Chief* and is the word from which we get *emperor*. .IVN short for Junior, used to distinguish from a parent emperor of the same name. NOB Nobillissimus Belonging to the highest aristocratic circles. PM Pontifex Maximvs The highest religious office, a notch below being a god himself. PP Pater Patriae Honorary *Father* of the empire.